How to catch a crocodile? In this drawing, the Flemish artist Jan van der Straet, called Stradanus (1523 —1605) shows us one particularly bold method. Hunters sit astride their prey, forcing long sticks between the crocodiles’ snapping jaws; companions armed with clubs wait nearby, ready to bludgeon the overpowered reptiles. The image isn’t based on first-hand observation—Stradanus never rode a crocodile, or saw it done—but was instead inspired by the ancient Roman author Pliny the Elder (AD 23 —79). In a note inscribed on the back of the sheet, the artist refers us to Book 8 of Pliny’s Natural History, to a passage describing the fearless inhabitants of a place along the banks of the Nile called Tentyra. Stradanus’ summary of these ancient lines, written on the back of the drawing, is composed in Italian, not Dutch. Although born in Bruges and trained in Antwerp, in his late twenties Stradanus had moved to Italy, where he found plentiful work at the Medici court in Florence. In the 1560s, for the family’s Tuscan villa at Poggio a Caiano, he produced designs for tapestries depicting hunting scenes. Following the success of that project, Stradanus undertook a similarly-themed endeavor that would reach a much wider audience: theVenationes Ferarum, Avium, Piscium (Hunts of Wild Animals, Birds, and Fish), a set of 104 engravings representing various modes of hunting. The series was carried out in collaboration with printmakers in Antwerp, and published over the course of the next three decades. 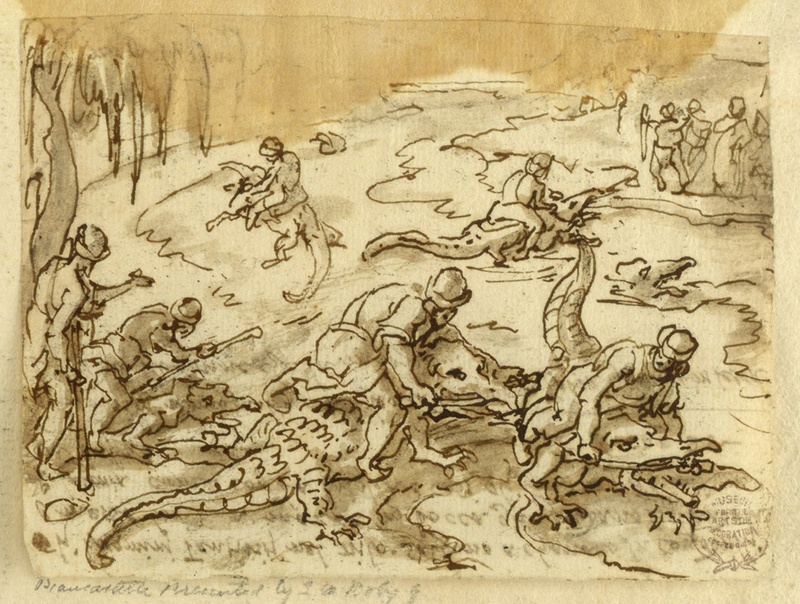 Plate 88, engraved by Carel van Mallery, depicts Tentyrites battling crocodiles in a composition descended from Stradanus’ loosely-worked drawing in Cooper Hewitt’s collection. Along the print’s lower margin, a brief explanation of the subject—this time in Latin—once more rehearses Pliny’s fantastic account of crocodile hunting along the Nile. Pliny the Elder, The Natural History. Translated by John Bostock (London: Taylor and Francis, 1855), 8.38. http://data.perseus.org/citations/urn:cts:latinLit:phi0978.phi001.perseus-eng1:8.38 Pliny’s Tentyra is a real place, now known as Dendera. gli huomini Tentiriti nel Nilo. salgono a chavallo su coccodrilli / e messa lor una mazza in bocca gli giudano pigliandola / p[er] la ponta come con la briglia e cosi gli fanno prigioni / del bastone / Plinio L[ibro] 8 cap. 25 / Li cocodrilli vanno nuotare nellaqua co[n] lomo da sopra giudano in terra / li de del huomine che la matzzano Although Stradanus directs us to Book 8, Chapter 25—which is indeed the chapter dedicated to crocodiles—the discussion of the Tentyrites to which he refers in fact appears as an aside in Chapter 38. Tentire in Aegypto, Nilum iuxta, insula gentem / Intrepidam gignit : Crocodili haec scandere dorsum / Audet : refrenat baculo os : discendere cogit / Ex amne in terram : mortem acceleratque nocenti. The author of the Latin captions was A. C. Kilianus Dufflaeus in Antwerp, and so presumably Stradanus’ Italian notes on the back of the page were not composed with Kilianus Dufflaeus in mind. On the frequent appearance of manuscript notes by Stradanus on the Cooper Hewitt drawings, see Michel N. Benisovich, “The Drawings of Stradanus (Jan van der Straeten) in the Cooper Union Museum for the Arts of Decoration, New York,” in The Art Bulletin Vol 38. No. 4 (Dec., 1956), 249—251.